The relative size or extent of something. A calibrated mechanism for measuring something. Ranging from scientific curiosity to existential realizations of our minuteness, scales serve multitudes of purposes. Take a look at this cool link, and see for yourself. Astrophysicists deal with objects and phenomena at scales that are often unfathomable. Putting them into the perspective of every day life is a challenge. I personally just avoid this, and focus on the phenomena that govern the workings of the Universe. Today’s story is of one such phenomena. Of one mechanism that operates between one of the smallest and the most massive scales in a galaxy. A black hole versus an entire galaxy. Active galactic nuclei (AGN) are luminous centers of galaxies that harbor an active black hole that is accreting matter-mostly gas- and fueling the AGN in the form of either super-luminous quasars, or in very cool cases, radio jets! An entire community of astrophysicists has kinda-sorta been able to unify different kinds of these fantastic beasts (and where we find them!) into a physical model (Figure 1). Figure 1. An active galactic nucleus – strictly an artist’s perspective. A pc is parsec, a unit astrophysicists fancy for historical reasons, equivalent to ~ 3 light years, or 10^16 m.
Why AGN are crucial to formation and evolution of the galaxy where they reside has been an open problem for a long time, and we are approaching definitive answers with better telescope facilities and simulations. But what observations ignited the curiosity around AGN in the first place? Figure 2: (a) The famous M-sigma relation, correlating central black hole mass to the velocity dispersion of other elements of the galaxy, like gas and stars. (b) A clear lack of high mass galaxies is seen in observations of elliptical galaxies, since luminosity is a direct indicator of star content in a galaxy. The distribution of luminous objects as a function of mass is plotted here. One. 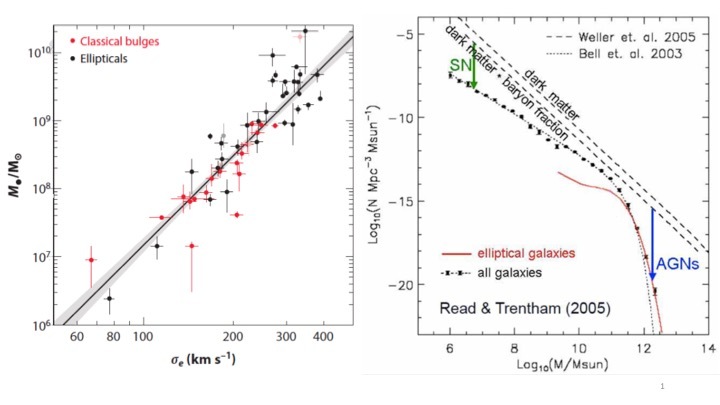 For a particular galaxy, there seems to be a tight correlation between the mass of the central black hole and the observed rotational velocity of stars and galactic gas around the centre, something we call velocity dispersion σ (see Figure 2(a)). This implies that the central black hole (at a scale of 0.1 parsec) is seemingly connected physically to the evolution of matter in the galaxy, constantly influencing it (at scales of 10-100 parsecs)! Two. You need gas in the cosmos to cool down and form stars in galaxies. Hot gas doesn’t compress and hence doesn’t condense into galaxies. In cosmological simulations (like these!) , we see an overproduction of luminous massive galaxies (as seen by the dip in observed galaxies in Figure 2(b)). Massive proto-galaxies (or dark matter haloes that host them) tend to cool faster and form massive star-forming galaxies. But the observations are just not seeing enough massive galaxies, suggesting that somebody turned off the AC and is not allowing gas cooling that could have formed more luminous stars in galaxies. This is famously called the cooling-flow problem in galaxy clusters. The answer to both these issues is intrinsically connected with the AGN ,a monster ‘feeding back’ energy and momentum into its surroundings. 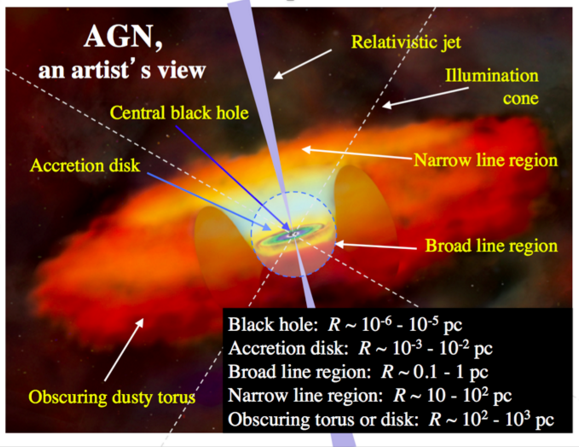 Andy Fabian’s seminal paper talks about all of these issues in great detail, and establishes a great setting for a solution that carries AGN on its shoulders, and it should. Fabian describes the cooling flow problem as well as a zeroth order analysis of gravitational energy of a black hole being able to influence motion of gas at galactic scales. He describes two modes that AGN (powered by a central black hole) find themselves in observations : Radiative (or Wind/Quasar) and Kinetic (or Jet/Radio/Maintenance) mode. 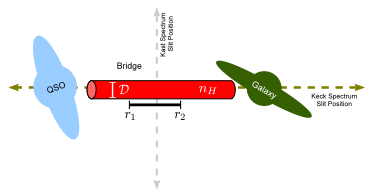 The radiative mode is responsible for uniform heating of the environment around it, and is responsible for the M-σ relation on a galactic scale. The kinetic mode, on the other hand, is seen like a janitor in galaxy clusters – maintaining the heating/cooling balance so that just the right amount of stars form as seen in X-ray, optical and Radio observations. Moreover, the radio jets seen in kinetic mode expel radio-heated gas from the accreting black hole matter outwards into the intra-cluster medium (ICM) and push away the existing X-ray heated cluster gas away. Hence, if you look at an X-ray image of a galaxy cluster containing a powerful AGN, you see ‘cavities’, which beautifully coincide spatially with cocoon/bubbles in a Radio-waveband image. This indicates a strong dynamical presence of AGN in galaxy clusters. Figure 4: (a) M87 galaxy with its AGN jet shocking gas around it. (b) Radio lobes of the AGN (red) seen alongside x-ray ICM gas (blue), a clear signature of quantitative AGN feedback. The field is still ripe. 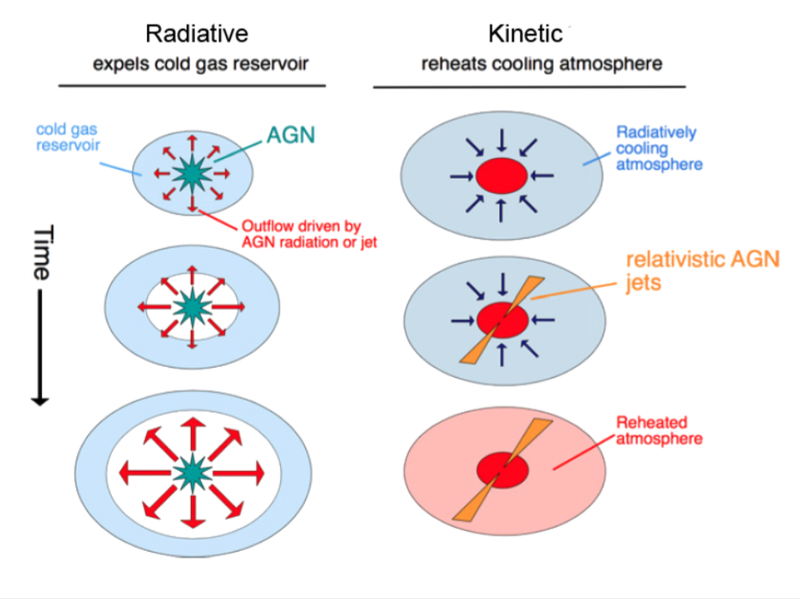 As opposed to ‘negative feedback’ by AGN preventing cooling of gas and subsequent star formation, we see evidence of AGN actually contributing to star formation in a ‘positive’ manner. They do this by projecting jets towards ICM gas and compressing gas that otherwise wouldn’t have compressed and radiatively cooled to form stars. Moreover, there is a strong dependence of AGN on morphology, as most AGN are found in elliptical galaxies. We also know that elliptical galaxies are formed as a result of galaxy mergers in the distant past, since even a merger of two spiral galaxies results in an elliptical galaxy and destroys spiral disk features. Do you think it’s merely a coincidence that elliptical galaxies are linked with both mergers and AGN? Or is it possible that mergers fuel black hole accretion by supplying more gas and causing highly luminous AGN activity? We are possibly close to an answer on this one (a part of my Masters thesis research at Cambridge involved looking for this correlation in massive datasets of the Dark Energy Survey). As a community, we are already on our way to build better telescopes. Radio facilities like ALMA, SKA and future X-ray missions after Chandra are only going to make our understanding of AGN feedback better. Fabian echoes this sentiment in his review. Perhaps that is the reason why we are initiating other probes to look for this effect. Cases in point are PLANCK, SPT and ACT, which are using Cosmic Microwave Background (CMB) maps of the sky with greater resolution than ever before, and attempting at characterizing thermal feedback at the centre of galaxy clusters with the Sunyaev-Zeldovich Effect. A great time to be alive, folks. Let me end with a question. 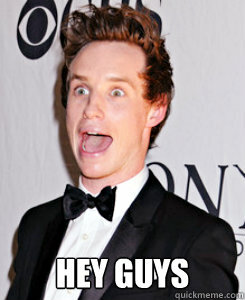 What do Andy Fabian, Hogwarts and Eddie Redmayne have in common? Think Galaxies.